Gold has been trading in a limited price range both today and yesterday. USD is supported by news about the consent reached between Canada and the US on updating the NAFTA agreement. Earlier, Washington threatened to withdraw from the agreement, if the document will not be significantly changed. In addition, the market holds investors' interest in risk, and the volume of speculative positions on the instrument is currently not high. At the same time, USD shows ambiguous dynamic against most majors. However, the trading instrument ignored the negative statistics from the US yesterday, which confirms the general sentiment at the market. The key event on Tuesday is the speech of Fed Chairman Jerome Powell. Investors expect to hear the comments of the official on monetary policy, as well as on the consequences of the US-PRC trade conflict. 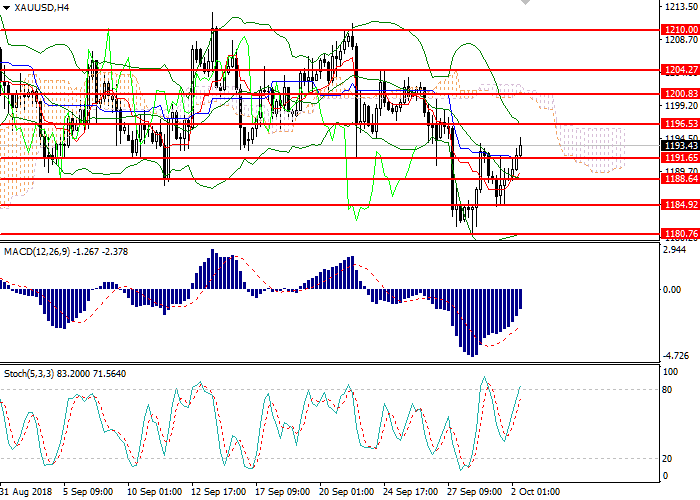 In the H4 chart the instrument is growing in the upper part of Bollinger Bands. The indicator is reversing sideways, and the price range remains unchanged, indicating the strengthening of the instrument in the framework of the intraday correction. MACD histogram is in the negative zone keeping a weak sale signal. Stochastic has entered the overbought zone and a strong sell signal can be formed during the day. Short positions may be opened from the current level with target at 1180.70 and stop loss at 1198.70. Long positions may be opened above 1198.70 with target at 1210.60 and stop loss at 1195.00.